Nektra Advanced Computing is glad to announce that we are always working on Windows Live Mail API improvements from all your feedback. Now in our Windows Live Mail API Trial you are able to access the storage folders with read, write, delete, move, rename and clone capabilities. We are also able to append text and or HTML code inside each cloned message. 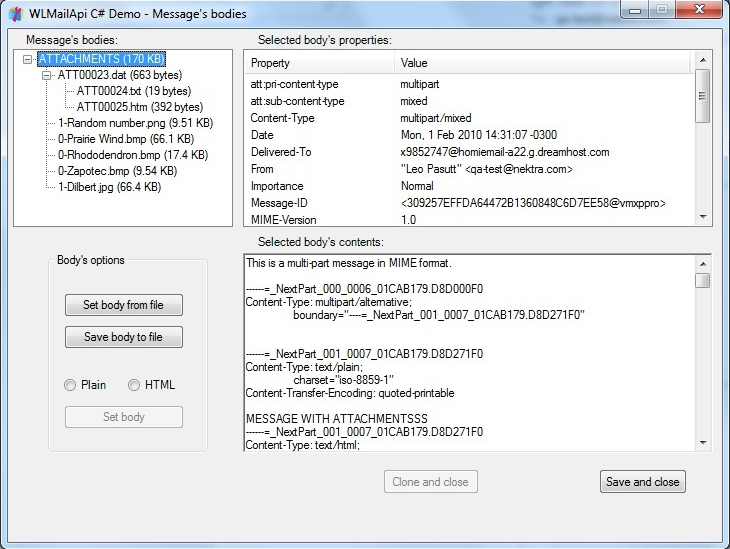 Here is a screen shot of the Message Bodies in our WLMailApi C# Demo and below a video showing more capabilities of our product. Is your windows Live mail API supports gmail folder (IMAP). If you are , let me know what version you support? The next version will support IMAP but please speak to sales about the new prices for the IMAP Version.